Drutex, as the only company in the industry, has been awarded the Premium Brand High Reputation title in a unique project on the Polish market testing reputation as an element of the competitive advantage among consumers. The „Premium Brand” Foundation for brand reputation has conducted the 13th edition of the national survey of brand and company reputation. It was carried out in March and April 2018 by Maison&Partners research agency, and almost 10 000 consumers familiar with the brand or company took part in it. Brand trust, references, loyalty, media image, CSR and image as a employer were evaluated. In this year edition for the 4th time the reputation of public figures was also examined. Premium Employer Brand awards were given for the first time. - It’s a great honor for us, especially that it is the fruit of our Clients’ opinions. 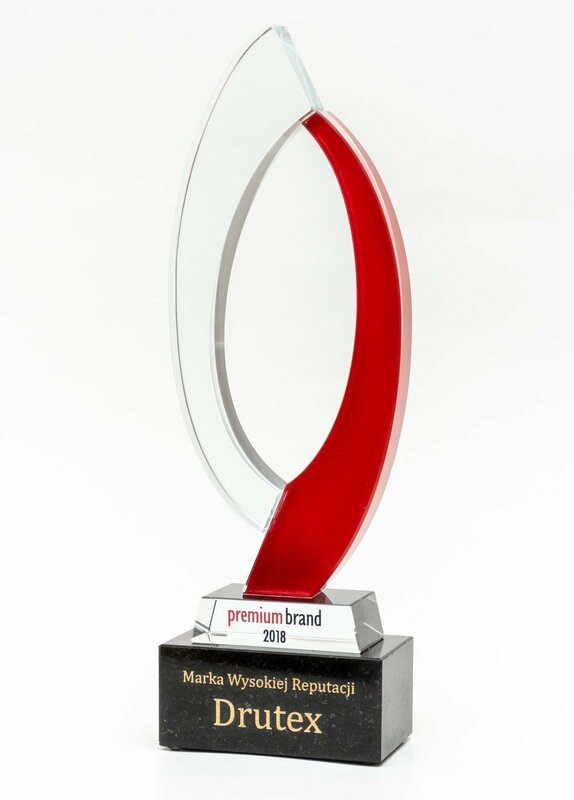 The Premium Brand High Reputation title is given to companies that play fair in business and in its surroundings and it is given only if the brand exceeds a specific indicator of reputation. The award is particularly important since we are in the group of very few awarded companies and the only enterprise in our industry. It shows great trust in our brand from our clients and business partners, and it also confirms our strategy of operations and building a strong, healthy brand – says Adam Leik, marketing director at Drutex. The survey has been carried out since 2006. This year edition included ca. 250 brands and companies in 20 categories assigned to products and services. The measure of brand reputation has been conducted according to an original method created by Professor Dominika Maison at Warsaw University. The project is organized by the „Premium Brand” Foundation for brand reputation. Apart from regular measure of reputation of brands and companies present on Polish market, the Foundation supports the idea of building brand reputation and the concept of treating reputation as one of key elements in competitive advantage in business. The Gala where the winners were awarded the prestigious Premium Brand High Reputation title took place on 23 May 2018 in the Warsaw Studio Bank.